First Person How can I parent mindfully when I get so tired of being a parent? 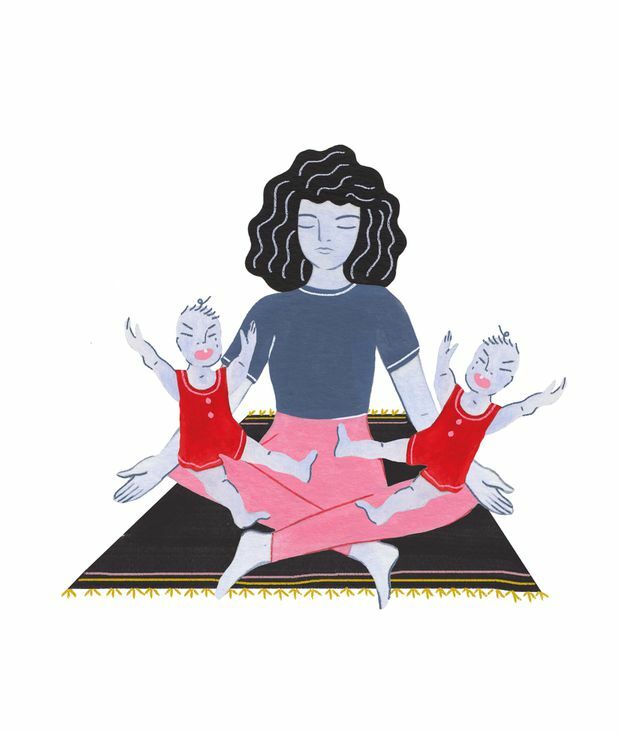 When my twins were one and a half years old, I decided to become a meditation teacher. The initial intent wasn’t wholly to be a meditation teacher, but rather to get a much-needed break from my life. The way I explained it to my partner and co-parent was a little different. I told him this course would move my career in a direction that was more meaningful. It made sense for long-term planning. It was an investment in the future. The fact that it would also be a weekly sigh of relief didn’t seem worth mentioning. Teacher-training wasn’t a vacation at the beach, but it often felt that way. With two meditation teacher-training courses under my belt, the next logical step was to teach meditation. Meditation is a regular tool I’d been using to “reset” myself for well over a decade and I am an avid believer. So when a local business owner approached me about teaching a class, I readily agreed. Ultimately, she convinced me to focus on mindfulness for parenting, as it was something she said she could use herself. We went about spreading the word, but after a few weeks, not one person had signed up for my class. Self-doubt began to creep in. Who was I to teach this class? Why did I think I knew more about parenting than other parents? Surely, they were all asking themselves the same question. This was only partially true. Or rather, it used to be true. As my children turned the corner from 3 to 4, and the epic tantrums died down, and the sleep deprivation hangover began to lift, and my kids began doing small things for themselves, I noticed a shift taking place. Slowly, I began having genuine moments of fun, I sometimes found myself in spontaneous laughter and even touched by bliss. Most days while mothering toddler twins, I cried at least once out of frustration or exhaustion. (Umm, yep, you’re peeing in the middle of this café, but my diaper bag is outside and I’m alone with two of you.) On my worst days, I would put my kids to bed, burst into tears, have a glass of wine and/or Google, “I hate parenting” just to see what would come up. And there it was. The paradox. The truth. The journey with my twins had been arduous, often unpleasant, but it was indeed beautiful. In the same way that love breaks our hearts and life’s sorrows bring us to our knees, parenting can take the wind out of us; it humbles us and strips away the things we enjoy most: free-time, napping, leisure reading, watching movies, self-care. And yet, on the other side of struggle and sacrifice are some of life’s most sublime moments. When my children were two and a half, their father had planned a boat ride for them with his parents, which happily meant a break for me. “Have fun,” I told them, giving each a kiss goodbye. The three of them started to walk way, but my son turned back to me. ““I always come back, mama.” he said. Like a reflection of my own karma, my son offered me the same words of assurance I had given to them so many times before. Small words that took my breath away. Wait, what? Just as I’m moving past cleaning bottoms, mega-tantrums and waking up five times a night ... we’re on to growing up and moving on? And I won’t just miss her when she grows up. I already miss her now. Just knowing that some day she will grow up, that she won’t be here right next to me, that holding her in my arms won’t always feel like the most natural thing in the world for both of us. These tiny, beautiful moments have been some of the most cherished of my life. What would I be willing to sacrifice for them? I don’t know. Maybe free-time, napping, leisure reading, watching movies, self-care. At least for a few years. My sister, being the sage she is, knew what to say when I needed to hear it. The day before my Mindful Parenting session, I found out that one person had signed up and would bring her two friends. In our cozy group, we meditated and shared stories from the trenches. Instead of casting off our mixed feelings as shameful or unacceptable, we approached them with gentle self-compassion, realizing that they’re part of life’s complexity, its paradoxes and its truth. Mixed feelings are okay for parents, and even okay for meditation teachers. Abigail Somma lives in Vienna.